but later captured by American military forces. 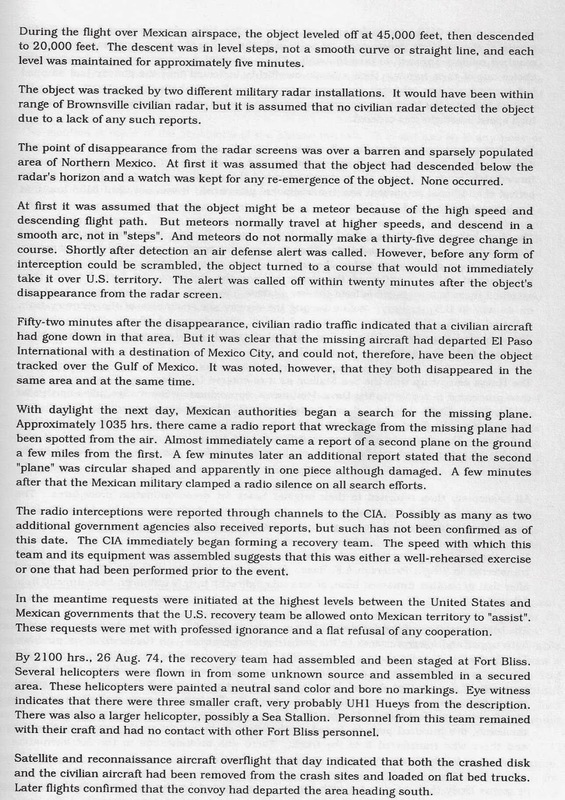 The crash was the result of a collision between a small, general aviation airplane that had taken off from El Paso, Texas, enroute to Mexico City, and a UFO that was tracked by radar into American airspace and then into Mexico. 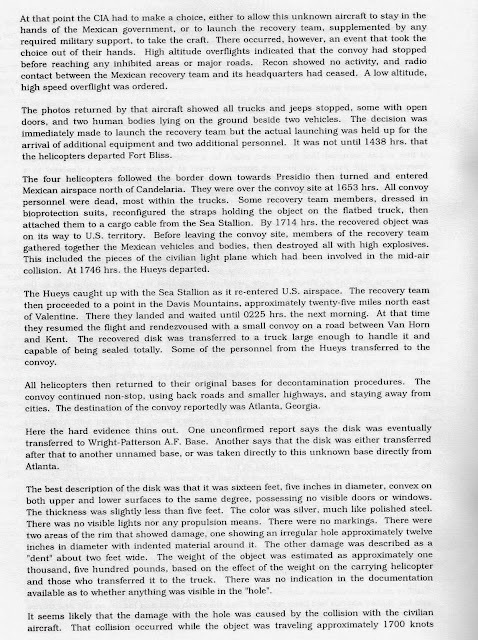 The story was first reported by Len Stringfield in his UFO Crash/Retrievals: Search for Proof in a Hall of Mirrors, Status Report VII published in February 1994. 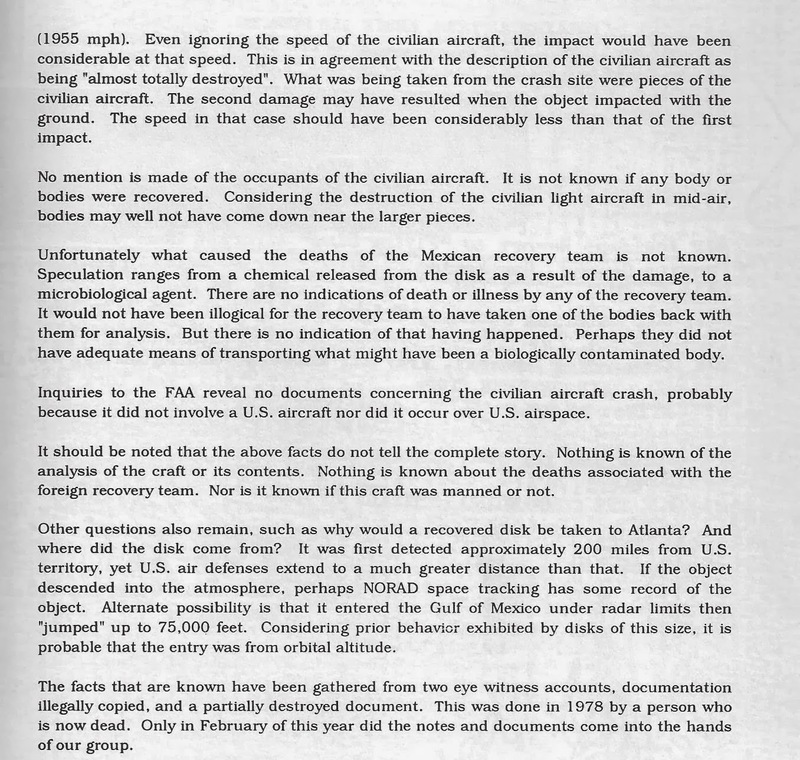 His source was Elaine Douglass, a UFO researcher active with Operation Right to Know, who received her copy of the report from JS, who is never identified, and who was apparently a member of something called the “Deneb Team.” This document was entitled, Research Findings on the Chihuahua Disk Crash and was dated March 23, 1992. Torres and Uriarte took up the challenge and began an investigation into this tale with the hope of adding to the information available. The result of that investigation is their book. It is an interesting book that is a fast read. 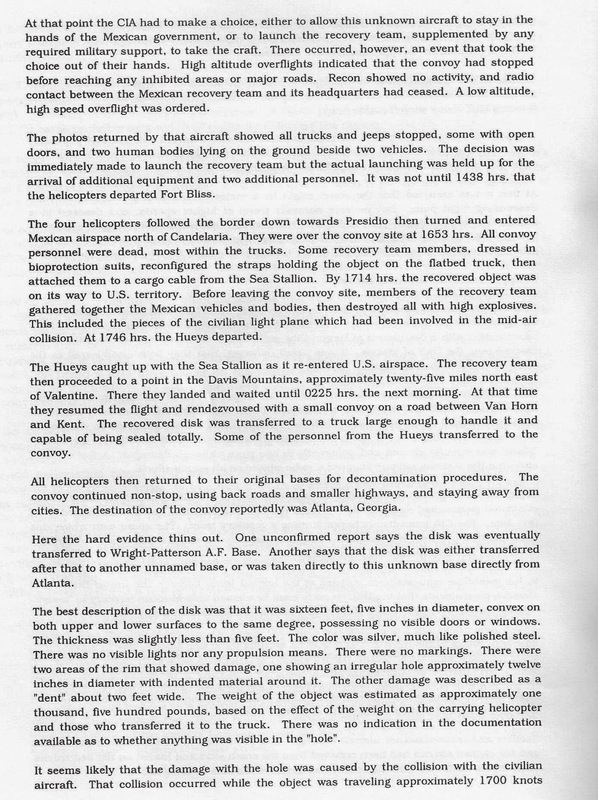 It is loaded with names and dates, but most of it is a description of their travels into Mexico and their attempts to find verification of the crash. 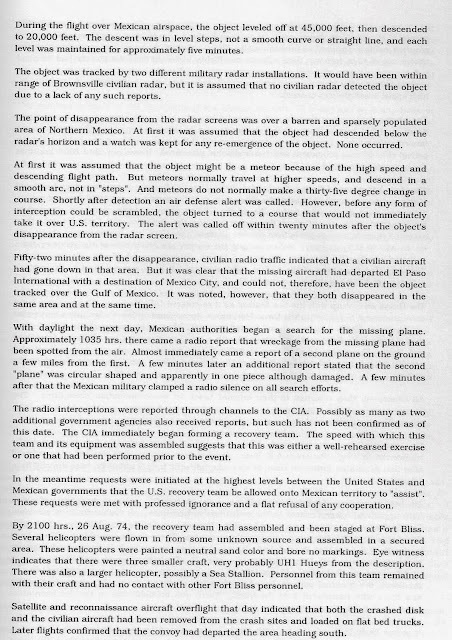 From the photographs it is clear that both of them were in Mexico and on the field where a small aircraft did crash in 1974. They found bits of wreckage and evidence of a hot fire. That debris, along with soil samples, was analyzed by an independent laboratory and while not all elements could be identified, that does not lead to the conclusion that there was something alien in it. They interviewed a man who was retired California police officer who told of seeing a small, strange creature when he visited his grandmother in the Coyame area in 1974 when he was 13. The creature he described was similar to that seen much later in Varginha, Brazil. But the creature can’t be tied to the UFO crash simply because the officer said that when he told his grandmother about it, she said she had seen the same thing. Her sightings preceded the UFO crash and she had said nothing to the family about it earlier because she didn’t think they would believe her. And here is the problem with the book. 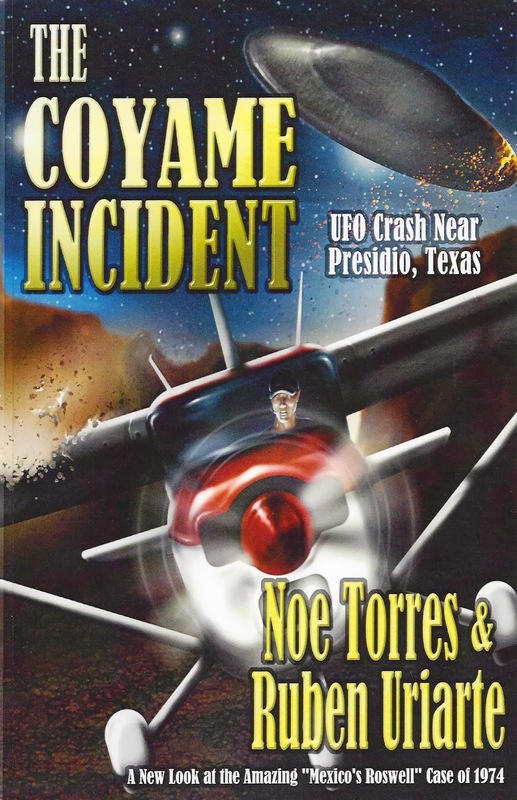 It contains other, similar tales that might or might not be related to the UFO crash, if one did take place. The witnesses, interviewed so long after the event remember seeing something that might have fallen in 1974. They might have seen the plane crash. There might have been soldiers in the area. And that sums up everything about the book. The evidence is thin but it demands more data. This is the same thing that Stringfield said in 1994 when he first reported the case to a wider audience. 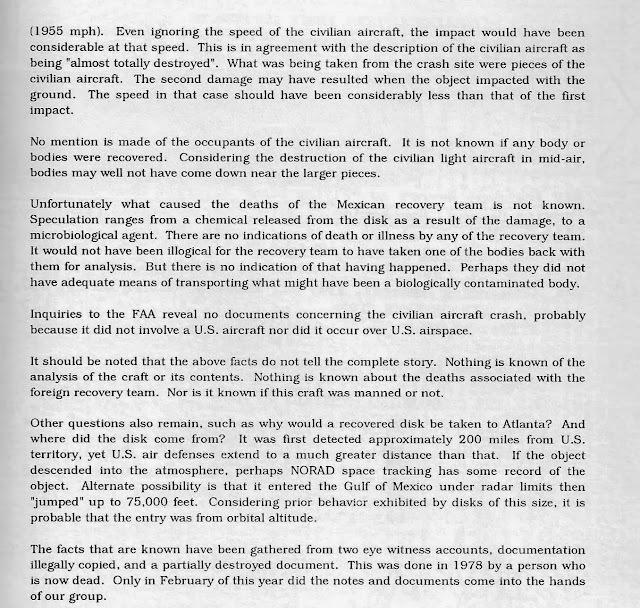 What we have here is an interesting account of an investigation into a reported UFO crash that has little in the way of evidence. That fact is underscored by the lack of information about the small plane crash. That one did crash in the area is not in dispute, but other than that, almost nothing is known about it including the name of the pilot. Torres and Uriarte are to be commended for their attempt to learn more about this incident. They have added a little data to the report but the real importance of their book is the descriptions of their research. Here we see how they have approached the case, how they investigated it, and what they have found. 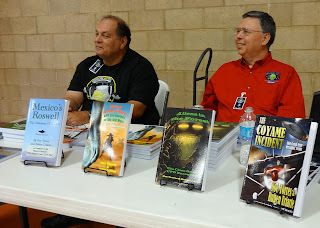 If for no other reason, this is why the book should be in every UFO researcher’s library. There is something to be learned about research methods here.